There are over 4,700 species of frogs inhabiting every continent except Antarctica. 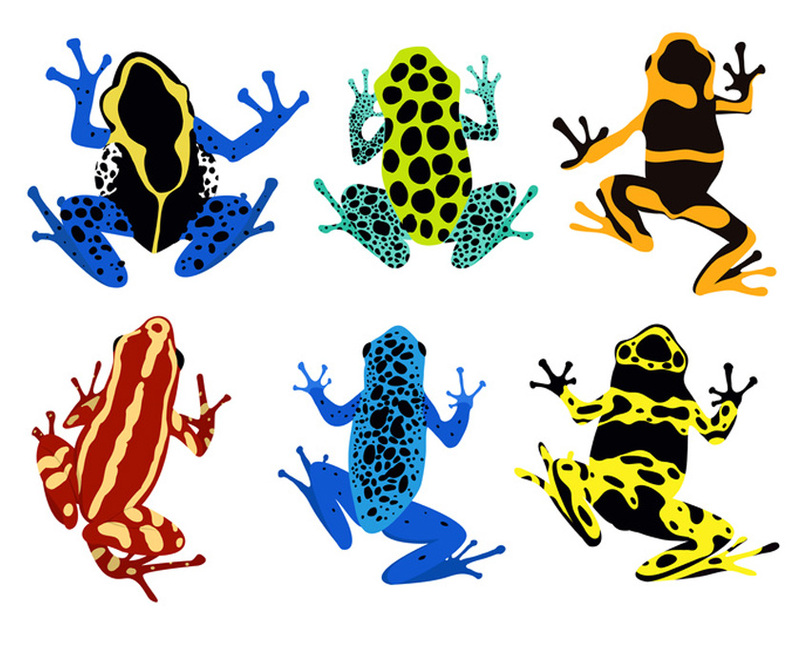 Out of those, there are more than 100 species of poison-dart frogs. 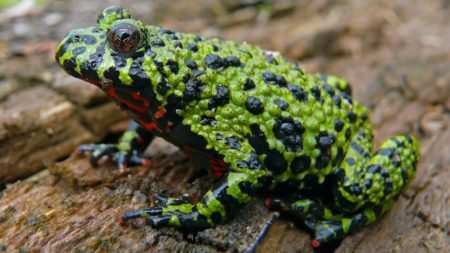 These brightly colored frogs inhabit the rainforests of Central and South America, Africa and other tropical and subtropical regions. They look beautiful but they carry with them a deadly alkaloid toxin. The side effects range from mild irritation to paralysis and even death. Aside from frogs, there are nearly 200 ‘true toad’ species, of which a handful of them harbor bufotoxins, which are harmful to humans and deadly for animals. There is a difference between a frog and “true toad” but that’s a topic for another post. Because people often use ‘frog’ and ‘toad’ interchangeably, I’ve decided to include them in this article. Yes, some toads are poisonous. They secret toxins from what are called parotoid glands, which are located just behind their eyes. So, without further a due, I’ll show you some characteristics of poisonous frogs and toads. 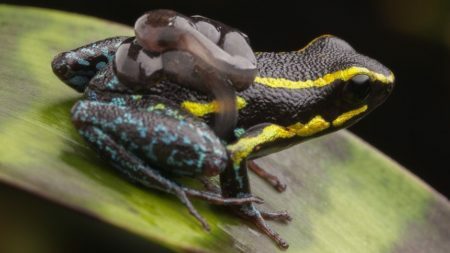 To finish things off, I’ll tell you about another potentially deadly thing frogs are carrying. The most defining feature of a poisonous frog is its color. 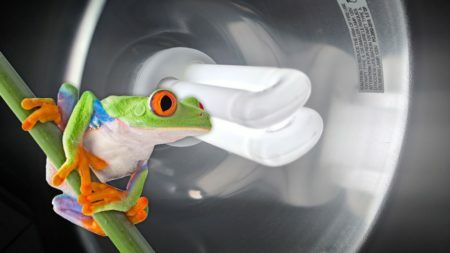 A bright, colorful frog may or may not be poisonous. As such, I strongly recommend treating all brightly colored frogs as poisonous, especially frogs from Central and South America and Africa. Don’t touch them! They look pretty, yes, but snatching up one of the more dangerous species can result in severe injury and even death. The reason the heading for this section reads “brightly colored frogs might be poisonous”, ‘might’ being the key word, is because not all colorful frogs are poisonous. 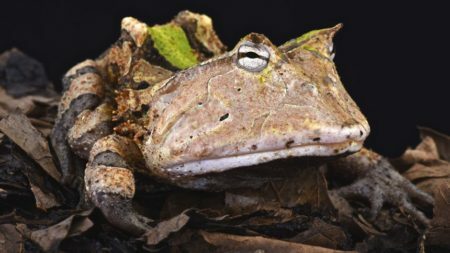 Some species mimic poisonous frogs in appearance, all-the-while not containing any poison at all. In the animal world, bright colors mean “stop!” “I’m dangerous”. This system tends to work, as bright colors often suffice in deterring would-be predators whether or not the animal is poisonous or not. This is why I included ‘might’, but again, unless you’re traveling with a trusted professional, treat every bright, colorful frog as poisonous; do your best to avoid them. 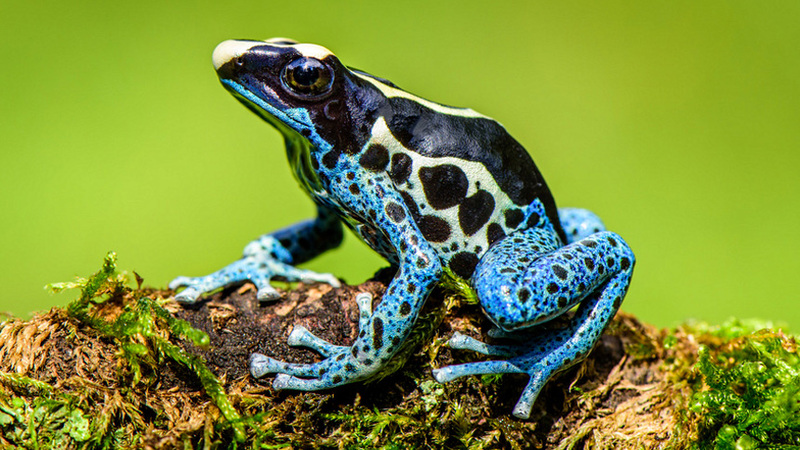 An interesting fact about poison-dart frogs is, they only produce poison by eating alkaloid-container insects. At least that what researchers suggest. 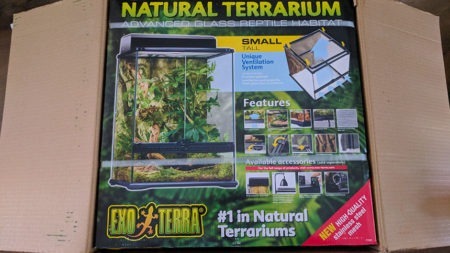 In fact, people have been keeping poison-dart frogs as pets for years, and it’s completely safe. In captivity, they’re usually fed small crickets or fruit flies which don’t contain alkaloid. Phyllobates bicolor is the 2nd most deadly frog in the world. It is similar in appearance to that of the Golden Poison Frog. The deadliest frog on earth belongs to the Phyllobates Genus. Its scientific name is Phylobbates teribilis which roughly translates to “dreadful leaf-climber”. 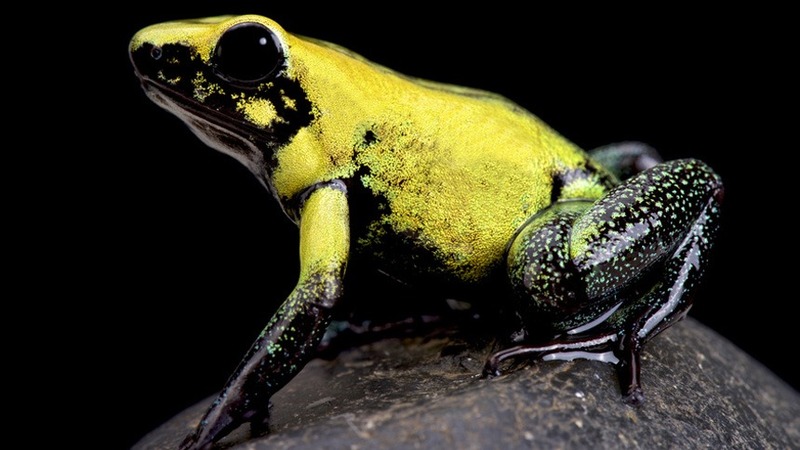 Its common-name is Golden poison frog and it has the deadliest poison of all. An average adult contains enough poison to kill two full-grown African bull elephants. There are some differences between frogs and toads but I won’t dive into that subject here. The reason I’m mentioning toads is that a lot of people use ‘frog’ and ‘toad’ interchangeably. Due to this, I added toads to this article because they can be harmful to humans and fatal to animals. 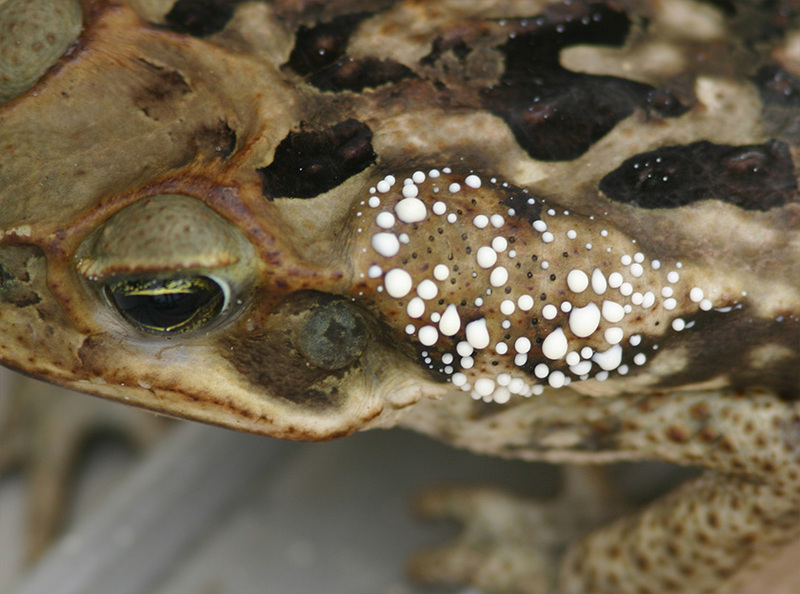 Toads carry bufotoxin in their parotoid glands, which are located behind their eyes. If the toxin were to come in contact with your mouth or eyes, it can be harmful; resulting in an allergic reaction, vomiting, and general discomfort. But, in most cases, this won’t happen because toads cannot excrete the substance on purpose. It has to be squeezed out. This is why animals are more at risk than humans. A playful cat or dog might fall victim to a toad if they bite and squeeze out the toxin. Cane toads are an invasive species in Florida and one to watch out for. American toads are another; they inhabit Central and Eastern United States. Suffice to say, you probably don’t have to worry about toads. If you happen to pick one up, just be mindful not to squeeze their parotoid glands. Should you happen to squeeze some bufotoxin out, gently sit the toad down and go clean yourself. Don’t rub your eyes or touch your mouth. In general, it’s best not to handle frogs. Chances are, you’re going to cause unwanted stress for them. Not only that, their skin is semi-permeable, so any chemicals on your hands will likely be absorbed by the frog, causing even more damage. 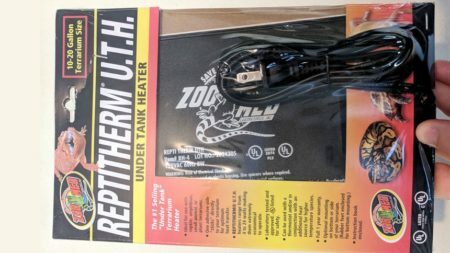 I imagine if you’re reading this post, you’re generally concerned about poisonous frogs and you want to be safe. Whatever the case, it’s important to know that while not all frogs are poisonous, they have been known to carry salmonella. Salmonella is not a poison, it’s a bacteria. It can be spread through amphibian droppings. To keep yourself safe, always wash your hands and use sanitizer if you happen to touch a frog or its droppings. And be mindful of children, as they like to pick up frogs and toads! I hope this post was helpful to you. If you enjoyed it, please consider sharing with family and friends. Hi I’m from Indiana and a frog living in soil sprayed pee into my eye and I flushed it with water and wondered if you had any suggestion to weather I should be at any panic . I’m from Indiana in the USA . Hey, Anthony. I’m sorry to hear that happened to you. Amphibians can carry salmonella and it’s often transmitted through their droppings. Don’t panic, though; not all amphibians have salmonella. I’m not qualified to give medical advice but I’d recommend calling your doctor to see what they recommend.